Evanston Township High School sophomores Leslee Muckleroy (left) and Angela Zachery sing Bill Withers' "Lean on Me." 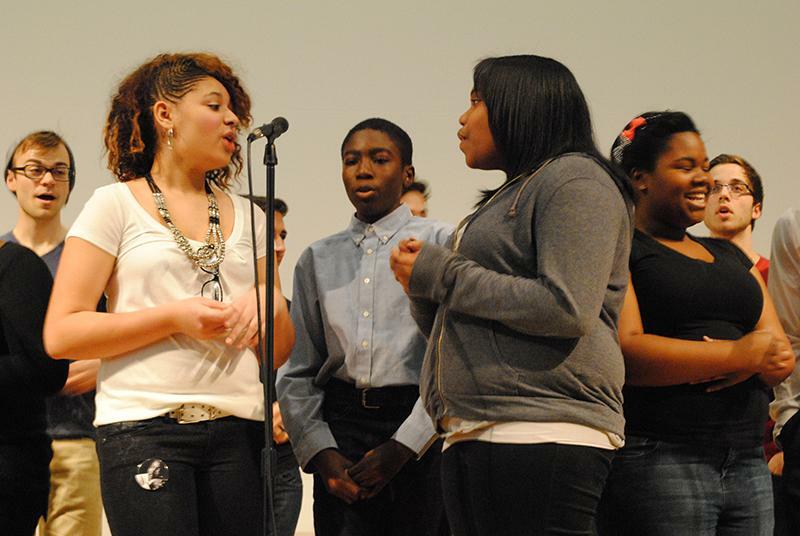 The group of students in the ETHS a capella group performed at a Martin Luther King Jr. Day community event organized by Youth Organizations Umbrella. More than 50 years after Martin Luther King Jr. gave his “I Have a Dream” speech, his dream is still a distant goal, Evanston residents said Monday at a community event. In commemoration of Martin Luther King Jr. Day, the Youth Organizations Umbrella organized its 8th annual Diverse Evanston Walks United event, during which students from local schools performed. More than 200 people attended the event, which began with a picture slideshow of students from the Dr. Martin Luther King Literary and Fine Arts School and recordings of King’s most famous speech read by youth. Speakers focused on how to achieve King’s dream today, when segregation is no longer allowed by law, but income equality and other social problems have hindered the movement for full equality. Y.O.U. executive director Seth Green introduced the event’s theme, “What It Takes,” and praised teachers in attendance for their dedication to youth. Mayor Elizabeth Tisdahl said after the event that income inequality is an obstacle to achieving the social equality King preached. Y.O.U. mentor Charles Jefferson said he had to learn to acclimate to Evanston’s diverse community after he transferred to Evanston Township High School at age 15. Now a Columbia College Chicago senior studying broadcast journalism, Jefferson encouraged young people to work to bring about change instead of relying on elected officials to do so. Y.O.U. site coordinator Kathy Graves also encouraged the audience of mixed demographics to empower themselves. The speeches were mixed with group and solo performances by local teenagers. Manuel Diaz, a student from Nichols Middle School, read his poem near the beginning of the event. “Someday, the only insult will be not to invite someone to your birthday,” he read. The group of ETHS students practiced the song for two weeks and learned techniques such as beatboxing. They coordinated with Northwestern’s a cappella group Freshman Fifteen on the production. During the event, Ald. Delores Holmes (5th) and Y.O.U. Founder and Director Emeritus Don Baker were given awards for their leadership in the community.